Here are 18 best free Online OCR Services. 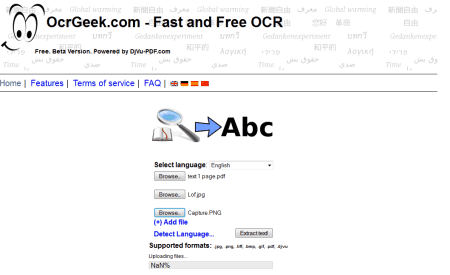 These free web services let you do OCR on various types of files including images and PDFs. You can convert these scanned files to editable documents easily. You don’t need to install any software to use these tools; only your web browser is enough. These have various features like: simple upload and download process, some let you do OCR in batch/bulk mode. Some supported input formats are: JPG, PDF, PNG, GIF, BMP, and ZIP (containing the said formats), supported output formats are: TXT, DOC, DOCX, PDF (searchable), XLS, XLSX, HTML etc., some gives the converted file link on the web page while other send the link to your email address, supports various types of languages for OCR process, like: English, French, Italian, Arabic, Dutch, Spanish and many more. You can also try best free Online Excel To PDF Converters, DOCX Viewers, and OCR Software. 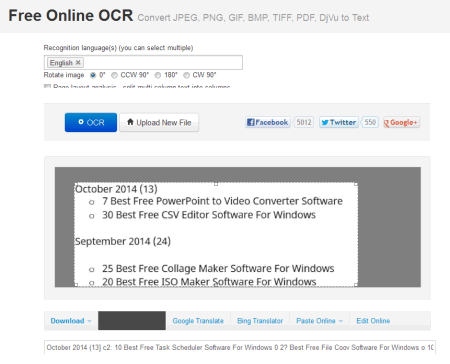 onlineocr.net is a free and easy to use web service which lets you do online OCR. You can upload maximum 5 MB size file for conversion. You can choose from various input formats like: JPG, PNG, PDF, BMP, TIFF, PCX, GIF, and ZIP file containing supported formats. Supported output formats include: Microsoft Word (DOCX), Microsoft Excel (XLSX), and Plain Text (TXT). It can OCR the input files in 3 easy steps. Select file in step 1, select language and output format in step 2, and click convert button in step 3 to get the job done. You can preview the output text also before downloading the converted file. You can register a free account for more functions. newocr.com is a free online OCR service. It helps you to recognize text from various types of scanned documents. You can convert JPG, BMP, PNG, GIF, TIFF, PDF, DjVu, ZIP etc. to editable text format by using this service. You can select the input file by clicking Browse button or can provide the URL of the file. You can click Preview button to start uploading and previewing the original file. Here you can select the recognition language, set rotation etc. Now click OCR to start the process. After finishing the process you will see the extracted text in the text area. From here you can download the captured text as Plain Text (TXT), Microsoft Word (DOC), or in Adobe Acrobat (PDF) format on your PC. Supports more than 75 recognition languages. 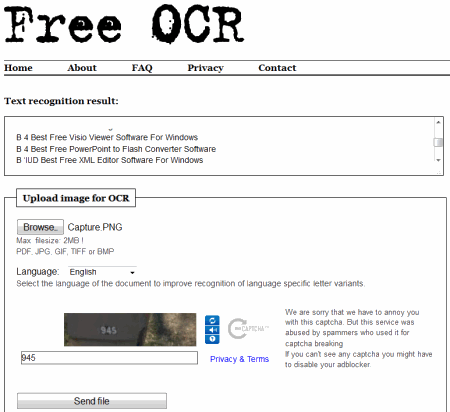 free-ocr.com is a free and easy to use online OCR (Optical Character Recognition) tool. You can extract text from scanned documents or images containing text as image. It does not require your email address. Supported input formats includes: JPG, BMP, TIF, GIF, and PDF (only first page). You can upload any of these file up to 2 MB in size, not wider or higher than 5000 pixels, and maximum of 10 images per hour. Just click Browse to select image, choose language and type the CAPTCHA shown and click "Send file" button to start the process. The captured text will be shown to you in the text area. You can use this text for editing or wherever you need. 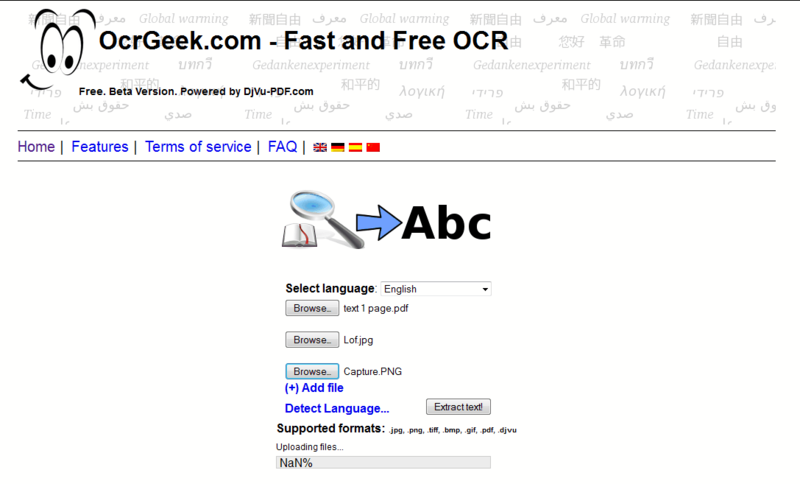 free-online-ocr.com is a simple and easy to use free online OCR web service. It lets you convert scanned documents or images into editable and searchable files. It supports various input file formats like: JPG, BMP, PNG, TIF, and PDF. Supported output formats includes: DOC, RTF, PDF, and TXT. Just select the input file by clicking Browse button from "Select your image or PDF file" tab. Now select the output format from the dropdown list. Finally click Convert button to start the process. You will get a download link of the output file on the same page. 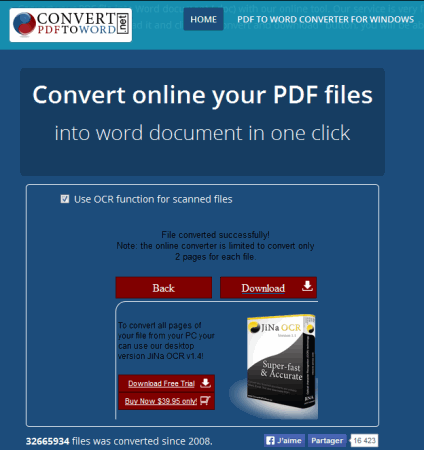 convertpdftoword.net is a free website which lets you do online OCR also. You can click "Use OCR function for scanned files" button to do OCR on scanned PDFs. After that you can choose the output format from various supported formats including DOC, RTF, TXT, PDF, DOCX, XLS, XPS, or HTML. After selecting the output click Browse button to choose the input file (supported input formats are: PDF, GIF, JPG, and PNG). You can download the converted file after finishing the process. It supports 2 pages for each file as a free service. 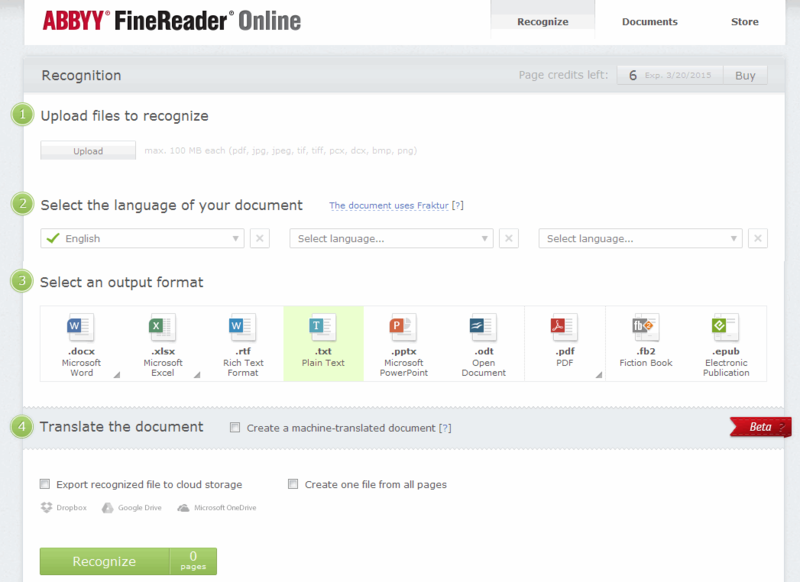 finereaderonline.com is a free web service which lets you do OCR online. You can convert scanned documents or images with text to editable documents easily. You can use 10 page credit limit for 15 days by registering a free account. The accuracy of converted document is high. Supported input formats are: PDF, JPG, BMP, TIF, PNG etc. And supported output formats are: DOCX, XLSX, RTF, TXT, PPTX, ODT, PDF, FB2, and EPUB. You can convert your input document into editable document in few easy to use steps. It gives you an option to translate the converted document into another language also. 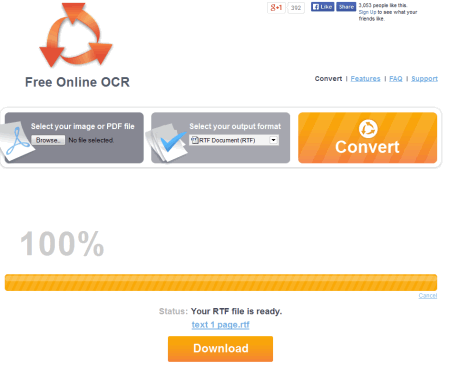 OCRconvert.com is a free and easy to use online OCR service. It lets you to convert your scanned PDFs or other supported image formats to editable Text documents. It supports bulk OCR or you can say; can select multiple files one by one and then can do OCR on them in batch. You can click Browse button to select a file and add it to a processing list. If you want more files then do the same. After that you can choose the language of the input file(s). Click Process button to start the uploading and OCR process. Once done you will get download links of the file(s) on the same page. i2ocr.com is a useful web service for OCR process. You can easily convert your scanned images of text to editable documents by using this free tool. Common input image formats includes: JPG, TIF, BMP, PNG, PBM, PGM, PPM etc. Supported output formats includes: TXT, DOC, PDF, and HTML. You can choose the input language in step 1. Select the input file or URL in the step 2. Type the shown captcha and click "Extract Text" button. After finishing OCR, you can download the result in any of the above said output format. Supports more than 60 recognition languages. to-text.net is a simple and user friendly website for online OCR process. 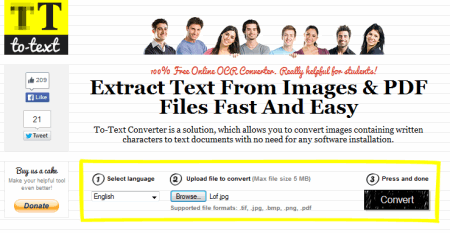 You can convert various types of images to text (TXT) easily by using this free service. You don’t need to register any account to use this. OCR process saves a lot of time of retyping. Supports more than 40 recognition languages. Just select the input language and click Browse to select the input file. After selecting the input image file, click Convert button to start the process. It shows the converted text on screen and you can download it to TXT format on your PC if required. 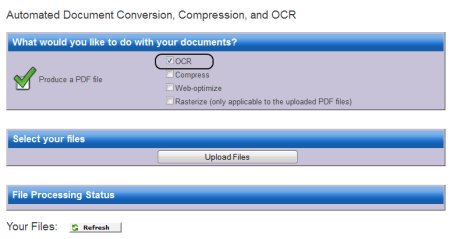 cvisiontech.com is a free web service which allows you to convert, compress, and OCR documents/images into PDF format. First select the task(s) (as in our case main task is OCR) by clicking the respective button. Now select your input files by clicking "Upload Files" button. Supported input format includes: PDF, TIF, TIFF, JPG, JPEG, and BMP. Your file(s) are ready to process. After finishing the process it shows a list of files. You can download the captured as well as converted to PDF files easily after providing your details. ocronline.com is a website which provides the facility of online OCR. You need to create a free account with it. After logging into your account you can upload the input file(s). First select the input document language and output format. Supported output formats are: DOC, PDF, RTF, or TXT. After uploading, select the file(s) and click PROCESS button. After finishing the process you can download the output file from the provided link. Supported input formats are: PDF, JPG, JPEG, TIF, TIFF, GIF, PNG, and BMP. 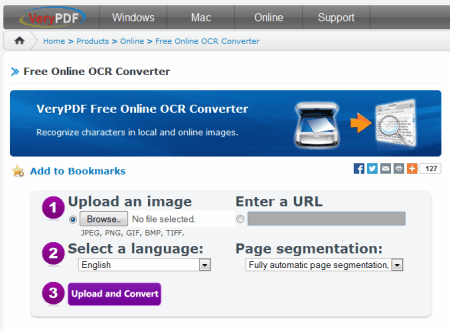 In a free account you can OCR up to 5 pages for free. 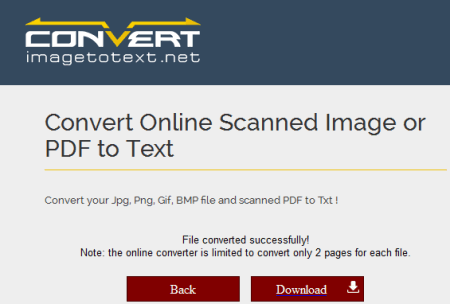 Convertimagetotext.net is a free and easy to use web service which lets you do OCR online. It supports various types of input formats, like: PDF, JPG, GIF, and PNG. 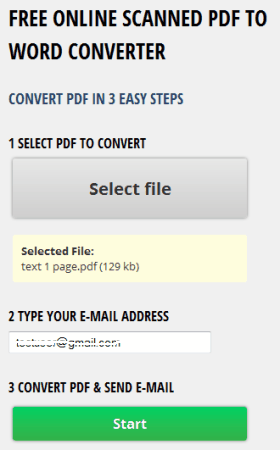 You can convert up to 2 pages per file for free in case of multipage PDF. Supported output formats are: DOC, DOCX, RTF, XLS, TXT, XPS, PDF, and HTML. The extraction takes a few seconds and you can download the output file from the provided link. 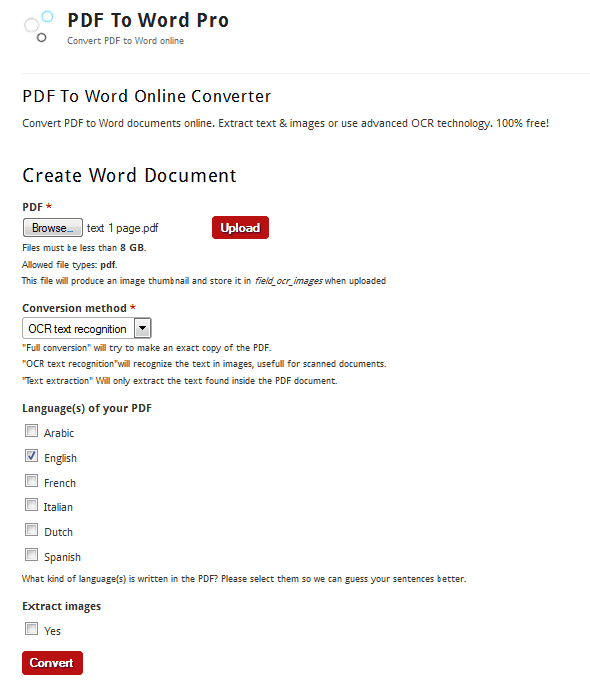 verypdf.com provides a free online OCR service. You can capture text from image easily by uploading them. Supported input formats are: JPEG, PNG, GIF, BMP, and TIFF. Just click browse button to select the input file. You can choose language of the input from drop down list. Finally click "Upload and Convert" button to start the process. You will be able to download a TXT file after finishing. You can use the captured text to any word processing application. investintech.com provides free OCR on scanned PDF files online. You can upload a scanned PDF and get an editable DOCX file in your email. Just upload the PDF file by selecting and provide your email address and click Start in final step. You will get an email around 30 minutes containing URL of the converted DOCX file. The extracted text quality is good. Here is one another technique which lets you do OCR on images as well as on PDFs by using your Google Drive. The process is very simple, just upload the image file or PDF containing scanned text to your Google Drive. Now open your drive by going to "drive.google.com" in your browser. Here you see all the files that you have uploaded. 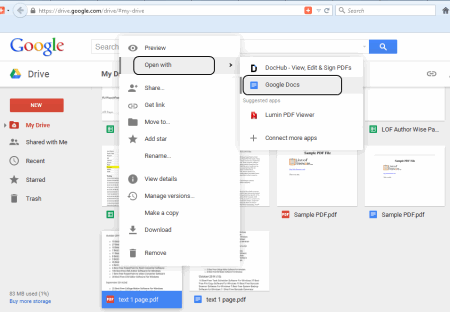 Now select the desired file and right click on it and select "Google Docs" from "Open with" sub menu. Now your file will open and the image or PDF is showing a blue border and editable text at the bottom. You can select the extracted text and copy it to the desired application or download the document again to your local drive using "Download as" from File menu in the desired format. 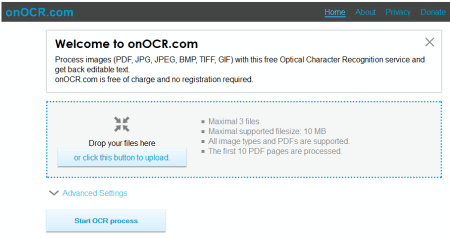 onOCR.com lets you do online OCR on PDF file as well as on various types of image files. You can drop your files to the given area or click the shown button to upload. You can do batch OCR also. You can bulk upload multiple files in one go. After clicking "Start OCR process" you will get extracted text on screen. You can copy it or download the TXT file containing extracted text. If you upload multiple files; you can download combined file too. 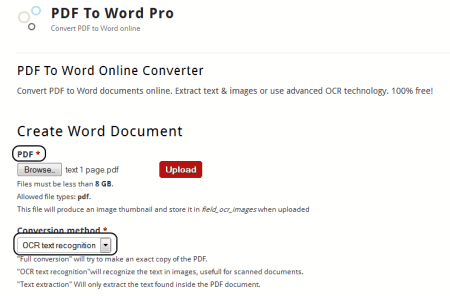 pdftoword.pro is a free and easy to use web service for converting scanned PDF to editable Word online. 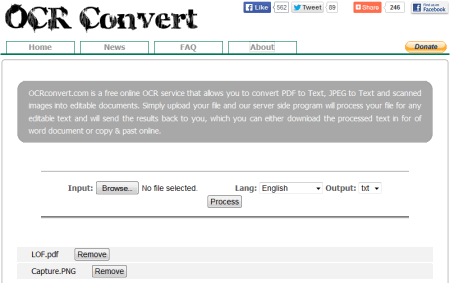 You have to choose "OCR Text Recognition" option from Conversion method. Now choose the language of your input file and click Convert button to start the process. After successful finish you can download the extracted DOC file from the link provided. You can upload the PDF file of size up to 8 GB. Supported languages for extraction are: English, French, Italian, Arabic, Dutch, and Spanish. ocrgeek.com lets you do online OCR in bulk mode. 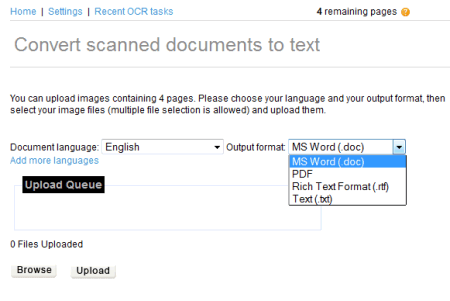 You can upload multiple files in one go and do a batch OCR on them easily. The whole process is simple and easy, just click Browse button to select file and click Add file button to select another. Now click "Extract text!" button to start uploading. All of your files will be OCRed and converted into TXT format (one text file for multiple input files). You can download the TXT files from the link provided. Supported input formats are: JPG, PNG, TIFF, PDF, GIF, BMP, and DJVU.